Inside the beautifully leather bound book one will find hand written sketches by the Civil War Veterans, preserved in their own hand writing for generations to come. 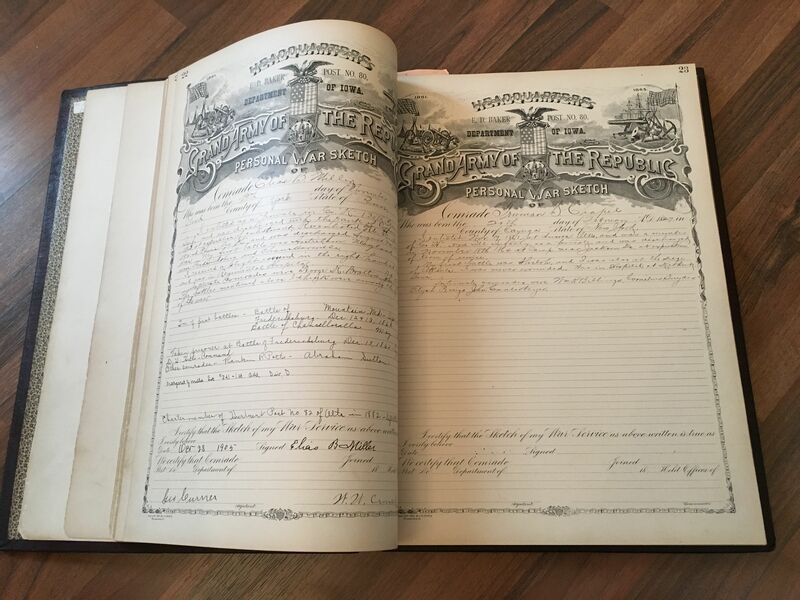 The original book is property of the Harker family and is on display in the house. The book also includes a brief sketch, in this case personal biography, of Mrs. Mary Allison Harker prior to the hand written entries of 64 veterans. All of the original entries in the book are signed and hand written. Around 2012/2013 the Harker Foundation with the help of a student intern from Buena Vista University in Storm Lake had the contents of the book transcribed and made into a digital document which is available here on our web page. In addition, the book was taken to the University of Iowa Library in Iowa City, Iowa where historians and archivists completed work to restore and preserve the book for future generations. Thanks to the hard work of Mrs. Mary Allison Harker and her children and grandchildren including Marie Harker Marshall this book has been preserved.